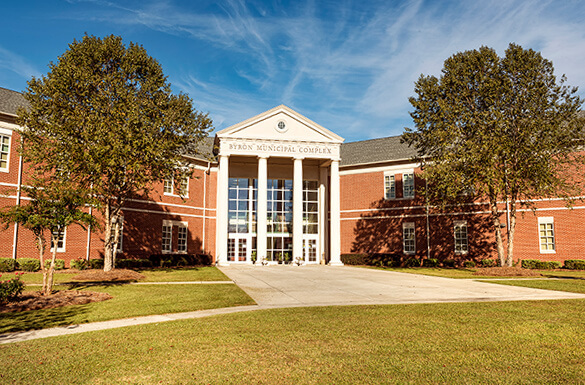 Byron, Georgia’s Downtown Historic District offers up a variety of architectural styles: 1860s Georgian, 1890s New South, late 1800s-early 1900s Victorian, 1900s Neoclassical Revival, and early 1900s Greek Revival. 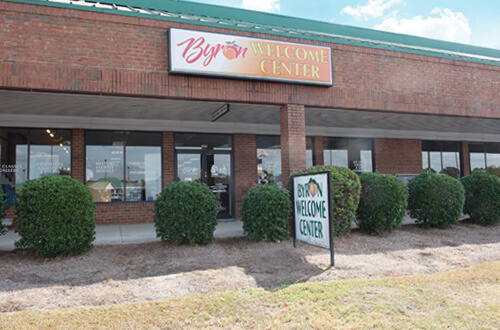 In 1995, Byron's Downtown and those homes in the immediate area were designated as the Byron Historic District and listed on the National Register of Historic Places. 1. Walker/Chisolm House, 200 Main Street - Originally built as the family dwelling of the David Walker family around 1860, this unique home is now a commercial location. 2. The Byron Depot, c. 1870 - Historic railroad depot and caboose, beautifully restored to reflect times in Byron more than a century ago. 3. Dr. Kay’s Office, 103 East Heritage - This 1930s clinic was the first of its kind in the area. It is estimated the doctor and nurse team of Dr. and Mrs. J.B. Kay delivered more than 3,500 babies in Byron. 4. 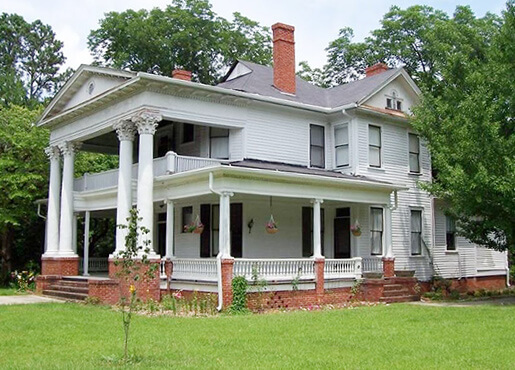 Vinson/Peavy/Chidester House, 200 East Heritage - This 1911 Neoclassical Revival house was built by Mr. W.W. Peavy as a residence for his family. Mrs. Peavy insisted Mrs. Waite’s grave, wife of one of Byron’s first mayors, be moved from the property to the cemetery before construction began. In 2006, Mike and Julie purchased the home and undertook a thorough restoration of it, which modernized its wiring, plumbing and insulation, yet preserved its Eastlake Victorian style and features. They moved into the home in July, 2007 and continue to reside there. 5. New South Cottage, 202 East Heritage - This 1890 New South Cottage served as the Methodist parsonage until 1928. 6. Poole/Barnes Home, 302 East Heritage - The Poole/Barnes home was built in 1910, following the death of Mrs. Poole’s husband. With assistance of Byron friends, the dwelling was completed with one dollar remaining in Mrs. Poole’s purse! 7. Vinson/Walker Home, 304 East Heritage - The Vinson/Walker home was built in 1914 by H.J. Peavy for his daughter, Bertha and her husband, J.W. Vinson, a Byron druggist for many years. 8. Evans/Peavy/Herndon Home, c. 1890, 205 West Heritage - The gabled ell Victorian cottage was built for the mother, wife and young daughter of James Guerry Evans from timbers sawed and cured on the Evans Plantation. The bricks of this house were at the plantation as well. 9. Warren/Pate Home, 104 Howard Street - Another gabled ell Victorian, circa 1910, was built by Dr. Moultrie Warren, who designed the molds for the unique foundation blocks. 10. Walker/Nash Home, 108 Howard Street - The Walker/Nash home was built in the late 1800s on property originally owned and operated as a working farm by the David Walker family. 11. Richardson/Warren/Collins House, 113 West Heritage - This Georgian cottage was built about 1860 by Dr. C.H. Richardson to be his son’s residence. 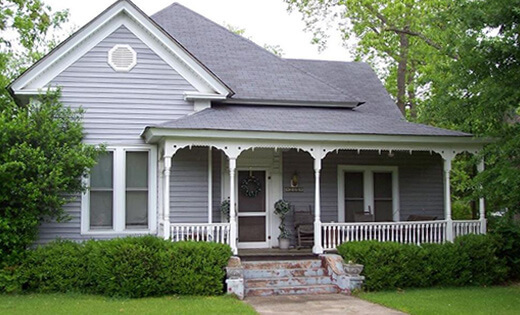 This house features a double front door with ornate trim over the windows. 12. Peavy/Robertson Home, 111 West Heritage - This home was built by David C. Dunbar for H.J. Peavy in 1887. The hipped roof on this house has a slight eave overhang with boxed dentil molding. 13. Warren/McCary Home, c. 1914, 109 West Heritage - This Greek Revival two-story house was built by H.J. Peavy for his daughter, Sadie, and her husband, Dr. Moultrie Warren. This house has nine fireplaces and a front door with a small balcony supported by columns. 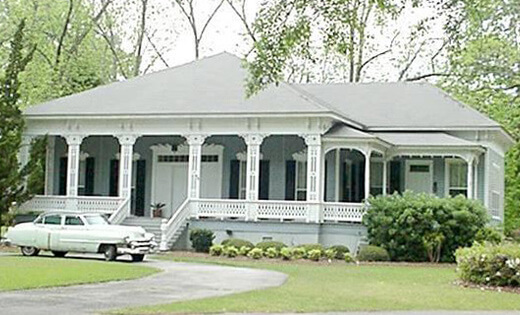 The full front porch features a porte cochere on the left and a matching side porch on the right. 14. Byron United Methodist Church, 101 West Heritage - This church built in 1922 suffered a devastating fire in the 1960s, destroying much of the church except for a structure used as an education building. The original, small stained glass windows survived the fire undamaged. 15. Vinson’s Pharmacy (closed), c. 1910, 100 West Heritage Blvd. - This shop, originally constructed for Dr. Moultrie Warren as a doctor’s office and drug store, later became Vinson’s Pharmacy, then Robertson’s Pharmacy. Robertson’s Pharmacy was a favorite gathering place for generations of Byronites. 16. Aultman/Stephens Home, 403 Main Street - This home was built in 1921 by Ross and Clint Hallman and features stately Corinthian columns said to have been imported from Italy. The Neo-Classical Georgian house is a Byron landmark. A walking/driving tour brochure is available from the Byron Welcome Center or the Byron Area Historical Society Headquarters.